478 pages | 900 B/W Illus. 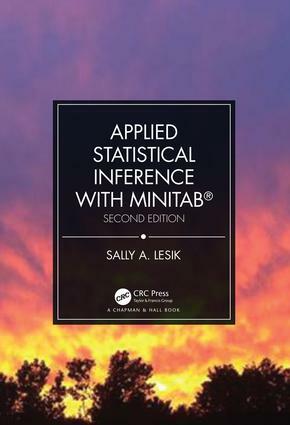 Applied Statistical Inference with MINITAB, Second Edition distinguishes itself from other introductory statistics textbooks by focusing on the applications of statistics without compromising mathematical rigor. It presents the material in a seamless step-by-step approach so that readers are first introduced to a topic, given the details of the underlying mathematical foundations along with a detailed description of how to interpret the findings, and are shown how to use the statistical software program Minitab to perform the same analysis. Gives readers a solid foundation in how to apply many different statistical methods. MINITAB is fully integrated throughout the text. Includes fully worked out examples so students can easily follow the calculations. Presents many new topics such as one- and two-sample variances, one- and two-sample Poisson rates, and more nonparametric statistics. Features mostly new exercises as well as the addition of Best Practices sections that describe some common pitfalls and provide some practical advice on statistical inference. This book is written to be user-friendly for students and practitioners who are not experts in statistics, but who want to gain a solid understanding of basic statistical inference. This book is oriented towards the practical use of statistics. The examples, discussions, and exercises are based on data and scenarios that are common to students in their everyday lives. Sally A. Lesik is a professor of mathematics at Central Connecticut State University. Dr. Lesik has taught many mathematics, statistics, engineering, and physics courses. Her primary research is in applied statistical inference.